Assign Subscriptions. The orange box on your dashboard shows the number “Unassigned Subscriptions” you have that can be assigned to students. 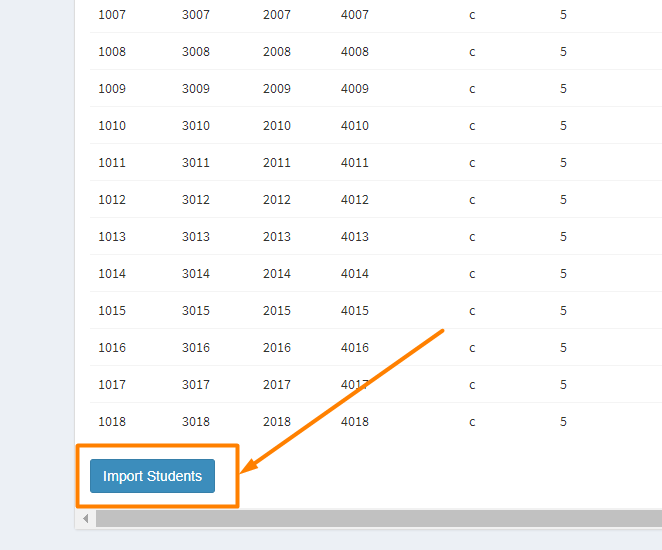 You can give these subscriptions to students by using the blue + Import Students Logins From CSV button. That page–the pop-up labeled “Import Student Logins From CSV” looks like this picture to the left. Begin at #1 and click on “CSV template to fill in” to get a properly formatted starting point. See the blank csv template to the right. You’ll enter the student’s first and last name, make up a username and a passcode for the student. Enter the code number for the learning track they will start in. You can change it at any time. 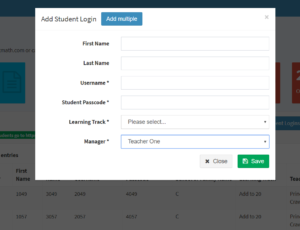 Add the Teacher Mgr’s email if you wish to connect the student to a different teacher that you set up in your account. Once you have completed the file, save it to your computer as a CSV file (it’s an excel file now, so you have to choose Save As and find Comma Separated Value -CSV in the list). After you hit “Parse CSV” you’ll see a list of your students. 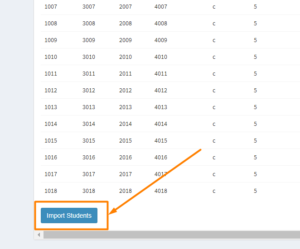 Scroll to the bottom and hit the blue button that says “Import Students.” Then they will be set up in the system. If something goes wrong, you can use the red button on your Dashboard that says “Delete ALL students!” It is extreme, but it will clear out all of your student data, allowing you to start over and re-import. 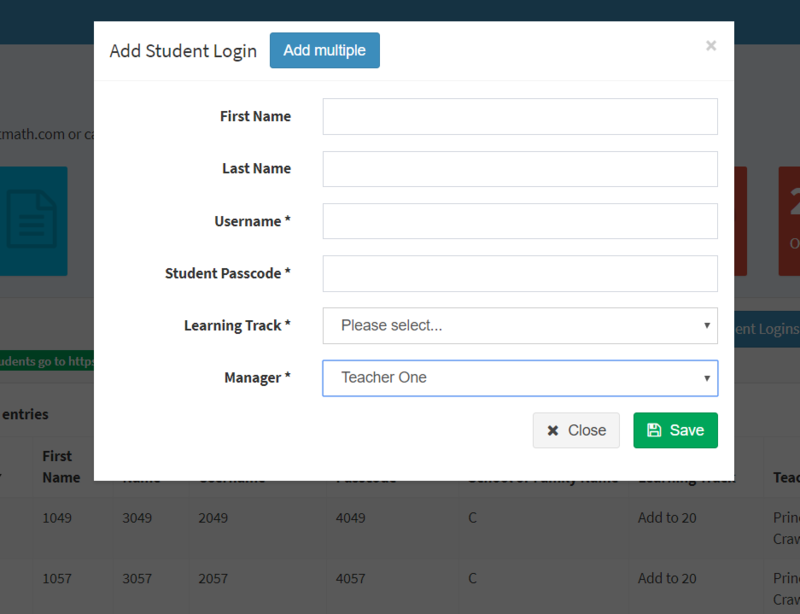 If you have few enough students, you can simply add their login information individually. In your dashboard click on the blue button that days + Add Student Login. Up pops this dialog box. Enter the student’s first and last name, then create a username and passcode. It only has to be unique to your school or family, so make it simple and easy to enter. Then be sure to choose a Learning Track from the pull-down menu. If you are the owner, you are also the first teacher. If you have other Teacher Managers, be sure to connect the student with the teacher you want. After you hit the green Save button your student is ready to play. The person who first sets up the account is the owner (probably you). The owner is automatically the first teacher. Next, if you need help, you can set up additional teachers and give them subscriptions. Go to the Teacher Mgr page by clicking on the Teacher Managers link in the left hand navigation. 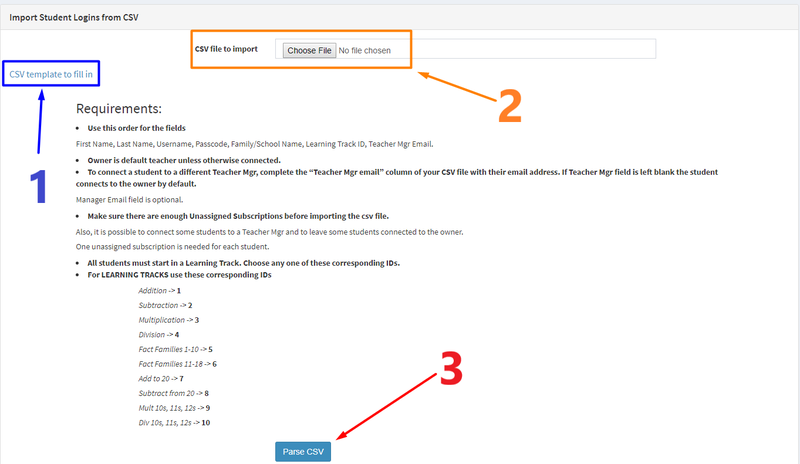 Then click the blue Add Teacher Mgr button in the upper right. You’ll see this dialog box (below) in which you enter the name and email. Don’t worry if you give them the wrong number of subscriptions. 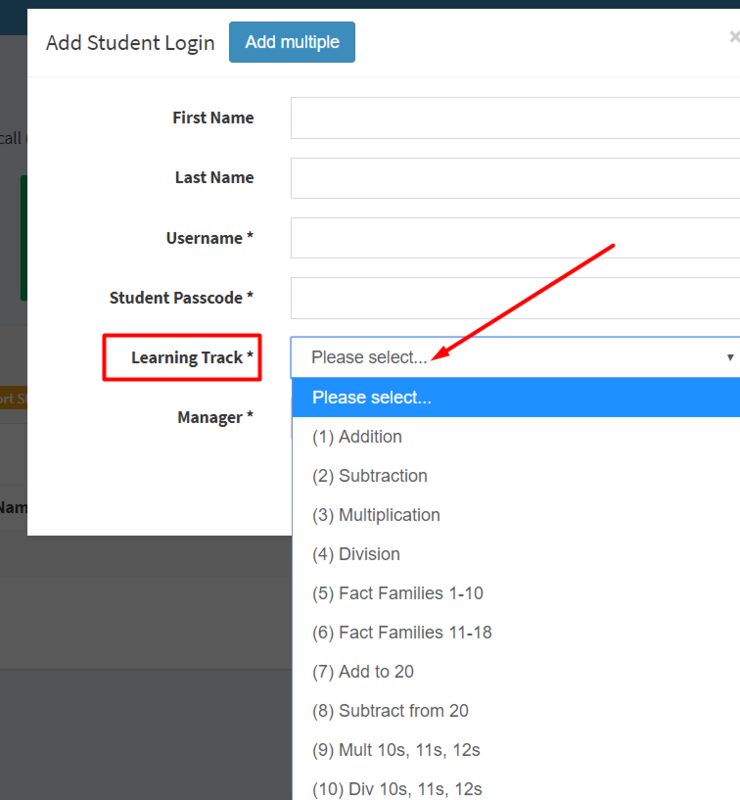 When you enter the csv file with the student logins, there is a place to enter the teacher for each student. The system will increase the number of subscriptions given to each teacher if necessary to accommodate what is in the csv file. When you hit the green “Create” button the system will create a password for that teacher and email it to the email you entered for them. It’s a hard password, so they might want to change it. Don’t wait too long to let the teacher know about the incoming information or they’ll miss the email and won’t know how to enter the system. Repeat as needed to add more Teacher Mgrs to help you monitor students. Next, you will go on to assign student login information to your “unassigned” subscriptions so the students can login and play. In the Rocket Math Online Game every student needs to be started in one of the ten Learning Tracks. 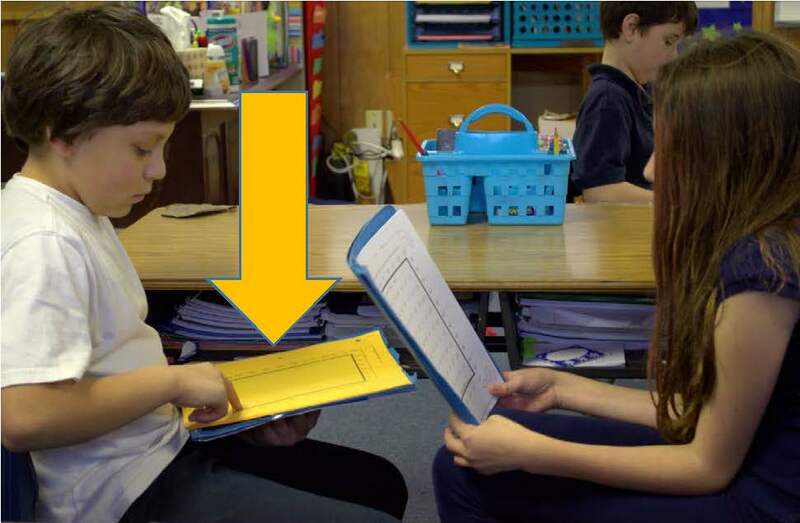 A student’s Learning Track can be changed at any time**, but one must be chosen to begin with. 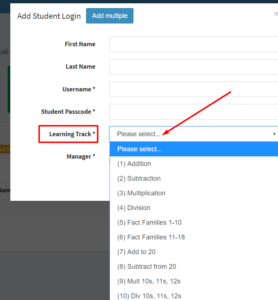 If you are entering the Student Login individually, you can use the pull down menu to select a learning track, as illustrated to the right. The ten learning tracks are numbered as follows. If you are using the csv method of entry you’ll need to enter the number for the track. You can click below to see a google document showing all the problems learned in each of the Learning Tracks. Click to see the problems in the tracks. Considerations, or what to choose when? Begin with the basics. The four basic operations are most important and typical expectations is one of those per grade level, so Addition in first, Addition then Subtraction in second, Multiplication, then go back to Addition and Subtraction in third, and Multiplication then Division in fourth grade, and then going back to get Addition and Subtraction if those haven’t been learned. 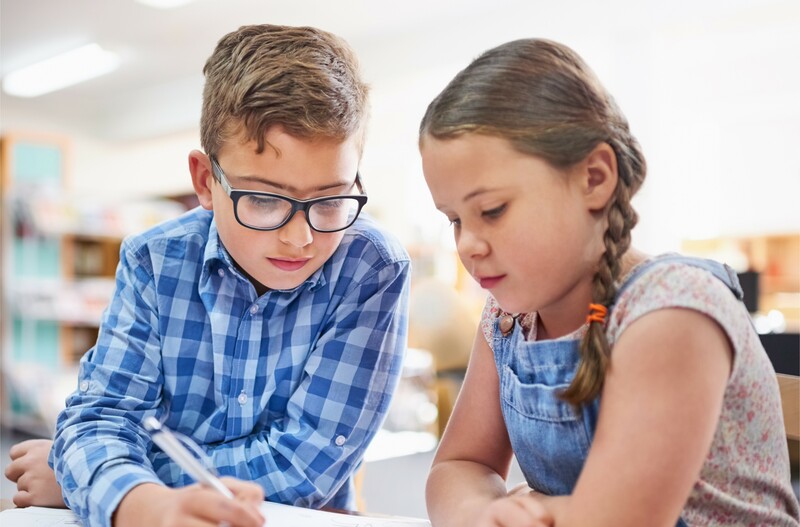 Make sure your student have worked through the expected basic operations for their grade level BEFORE doing any of the other optional Learning Tracks. Another way to learn basic Addition and Subtraction Facts. Learning in Fact Families is another order to learn. Fact Familes (1 to 10) add and subtract would be chosen in first grade. Fact Families (11 to 18) add and subtract would be mastered in second grade. You can choose this sequence instead of the basic addition and basic subtraction fact Learning Tracks. Optionally, Fact Families is also a good way to review for students who have already learned the basic addition and subtraction facts in first or second grade. Optional Learning Tracks. Add to 20 and Subtract from 20 are additional problems that the Common Core feels should be committed to memory. They are composed of facts you can figure out if you know the basic 1s through 9s facts, but can be learned AFTER the basics are learned, if there is time in first or second grade. They should not be assigned until after the student has mastered the basic 1s through 9s addition and subtraction facts. After students learn the basic 1s through 9s multiplication facts, if there is time, they can move on to 10s, 11s, 12s. After basic 1s through 9s division facts are learned (and all the other basic operations are learned) then the 10s, 11s, and 12s are a good use of time. 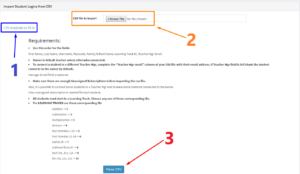 **See “How to change Learning Tracks” in the FAQs and Directions document. Why is a gifted student having trouble with Rocket Math? Answer: I’ve blogged a bit on some of these issues elsewhere on the Rocket Math website, but let me try to be more specific here. 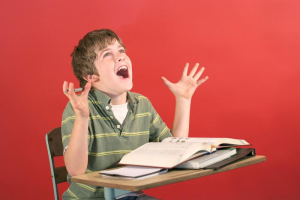 First, gifted kids are stunned to find out that they have to work hard to memorize math facts. They probably need three or four days of practice—which to them seems like failure. They are like an athletic kid who excels easily at every sport but finds he needs to work out with weights as much as a klutz to get to be able to lift heavy weights—his natural talent doesn’t help in this instance. So kids who’ve never had to work to learn things before, really are annoyed by having to practice several days in a row. But it is really good for them! How is mom practicing with him at home? Can she video him doing the test “untimed?” If the child is “writing facts” and “without a timer” then he may be figuring out facts over and over—but is not getting to instant recall. That’s why the oral peer practice is so critical—if there is even a slight hesitation the child is to repeat the fact three times, back up three problems and come at it again—until the answer comes with no hesitation. There is a fundamental difference between instant recall of facts from memory and strategies to come to the answer by thinking it through. My parent letter addresses how to practice. On the other hand, if the student is able to write the answers to math facts at a fast enough rate to complete 40 problems in a minute, but only when he thinks he is not being “timed” then he needs to learn how to do the same thing when he is being timed. If he is not learning with the daily practice, we have to ask, “Why not?” Social kids sometimes socialize instead of practicing. Social kids also can convince their partner not to do the correction procedure. Or they just say the answers instead of the whole problem and the answer. Any of those things would result in not successfully learning the facts. The teacher would need to monitor the quality of the practice. My experience has been that when students are “stuck” or “having difficulty” even just one session of practice done the right way rigorously (with me) and they suddenly improve enough to pass or to recognize they can pass the next day with another session of rigorous practice. Last of all, sometimes the writing goals are off because of some glitch in how you gave the writing speed test. So the student might know the facts well enough but not be able to write them fast enough to pass the tests. If the student can answer 40 facts in a minute in the current set (just saying the answers without having to say the problems) then the facts are learned to automaticity—and the goal in writing should be lowered to whatever the student has done to this point. Hope this helps. You are right not to excuse this student from learning math facts to automaticity. He might be a stellar mathematician someday if he learns his facts well enough that math computation is always easy for him. If math computation remains slow or laborious he won’t like it enough to pursue it as a career. 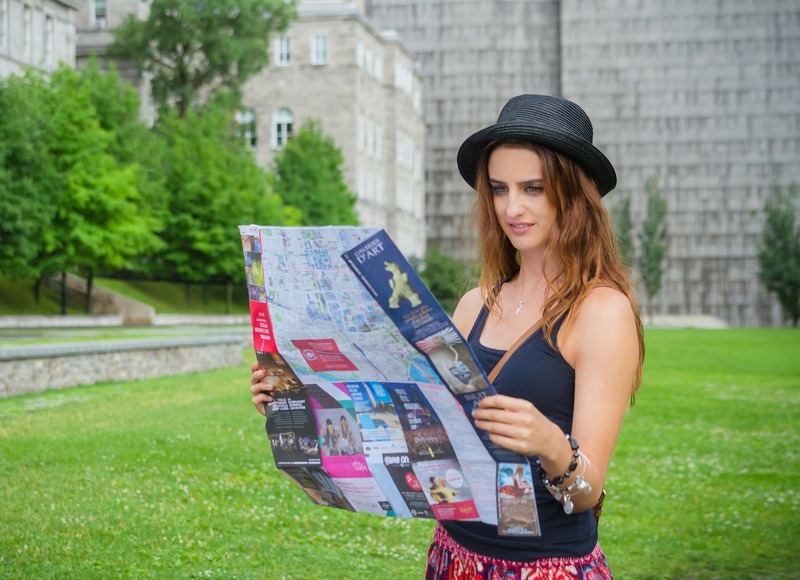 Without the directions you may get lost! What happens when teachers don’t have a copy of the Rocket Math Teacher Directions? Bad things! When teachers don’t have the written directions to Rocket Math, the essence of the program usually gets lost. Procedures get modified and modified over the years until they are not even close to what should be occurring. Sometimes we have found schools that are not even providing daily oral practice. Other schools don’t give the answer keys to the peer tutors. Other schools don’t give the writing speed test and make up impossible-to-reach goals for students. We often see teachers implementing the “Rocket Math” program incorrectly and wondering why it doesn’t work. We ask them if they have read the teacher directions, and they say they didn’t know there were any. When teachers have never seen the directions, is it any wonder they don’t know what they are supposed to be doing? Hear-say directions handed down over the years from one teacher to another just don’t convey all the important details. Teachers need the directions! This is why I’d like you to have my complete directions for free. Even if you purchased Rocket Math ten years ago and haven’t gotten the updated versions since then, you can have these directions for free. I have them in three places. I have the directions broken out into FAQs on their own web page here. That’s easy for quick reference. The second place I have the Teacher Directions is as a downloadable booklet you can print out and distribute. The Rocket Math Teacher Directions for the worksheet program booklet is here. Please print this out and give to your teachers, especially in schools that began implementing several years back. Read them and have a discussion at a professional development time. You will be astounded at how much your implementation differs. The third place I have the Teacher Directions is in the “filing cabinet on the web” for those of you who have the subscription. In the “Forms and Information” drawer we have the booklet and the FAQs which can be opened and printed out. In school-wide implementations of Rocket Math, principals or math coaches need to take a leadership role. The Administrator and Coach Handbook gives you forms with what to “look-for” in a Rocket Math implementation. If you use that to observe Rocket Math in your classrooms you’ll quickly see whether or not things are going the way they should. If you have a subscription to Rocket Math you’ll find all of the chapters of the Administrator and Coach Handbook in the “Forms and Information” drawer of our filing cabinet on the web. Please take the time to see that you or your teachers are implementing Rocket Math according to the directions. Trust me, it works SO MUCH BETTER if you do. I wouldn’t steer you wrong! The sooner you provide extra help the easier it will be to catch them up. How can you know when students need help to meet expectations? Use the graph above, which is available from the Educator’s Resources page or here: One Semester Aimline. It is also available in the basic subscription site, Forms and Information Drawer as an optional form. It is an “aimline” for finishing an operation (Sets A-Z) in one semester. Schools that don’t start Rocket Math in first grade need students to finish addition in the first semester of 2nd grade and subtraction in the second semester. This means that students who get stuck on a level for even a week need to be helped. 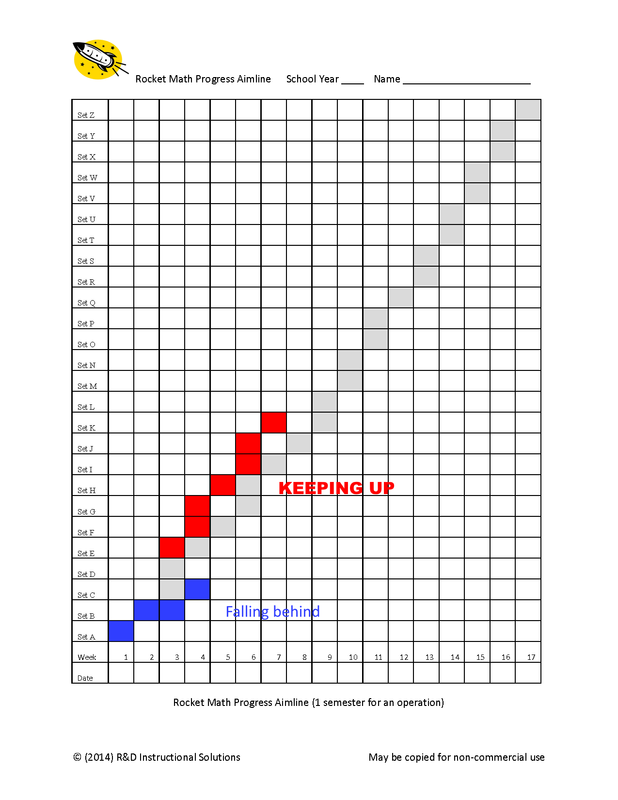 If you indicate on this graph the week in which the student finishes each set in Rocket Math you can tell if the student is making enough progress, or if he/she needs to be getting extra practice sessions each day. If the student is working on a set above the line of gray boxes or on the line then progress is adequate–they are on track to finish the operation by the end of 18 weeks of the semester. But if the student is working on a set that is below the line that means he/she needs intervention. In the example above the student whose progress is shown in red is above the aimline. That student has been passing at a rate that means he or she will finish the operation by completing Level Z by the end of the semester. That student does not need any extra intervention. In the example above the student in blue is falling behind. By the fourth week that student has only passed Level C and so he needs to have extra help. The first step would be to ensure this student has a good partner and is practicing the right way. Sometimes students don’t stay on task or do not listen and correct their partner. If hesitations are allowed (while the student figures out the answer) and not corrected the student will not improve. Fix the practice in class first and see if the rate of passing improves and the student starts to get up to the aimline. The second step is to include this student in a group of students who get a second practice session each day. 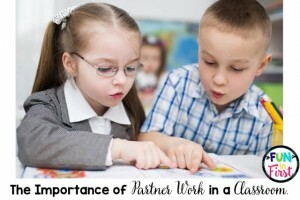 They would work in pairs and do another Rocket Math session each day. Whether or not they take tests is unimportant. What is important is that they do the oral practice with a partner who corrects their hesitations as well as their errors. This could be done by a Title One teacher or assistant or a special education teacher or assistant. It should only take ten minutes. Another step is to involve parents if that’s possible. Another practice session (or two) at home each evening would make a big difference. Parents will need to know how to correct hesitations, but there’s a parent letter in the Forms and Information drawer for that. Also note that siblings can do this practice as well, as long as they have an answer key. 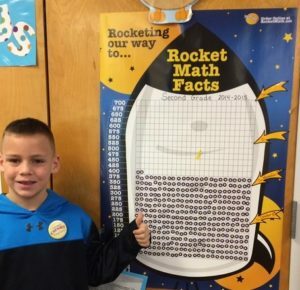 You will be pleasantly surprised at how an extra few minutes a day of good quality practice can help students progress much faster at Rocket Math. The sooner you intervene, the easier it will be for the student to catch up. NOTE: There is an aimline for finishing one operation in a year. It is also in the Forms and Information drawer and on the Educator’s Resources page of our website. If you follow recommendations and do addition in first grade, subtraction in second, and multiplication in third you can use that aimline. It won’t require intervening on so many students. What about students who can’t pass in 6 tries? Help! I’m feeling bogged down in Rocket Math. I have some students who have been working on the same sheet for over 10 times and are no closer to passing. What am I doing wrong? The problem could be one of several things. You have to diagnose what it could be. I am assuming you have students practicing orally in pairs, with answer keys, for at least two minutes per partner every day (as shown in the picture above). I am assuming you already have students, who do not pass, take home the sheet on which they didn’t pass and finish it as homework and practice with someone at home. The extra practice session at home each day can be a big help and the students should be motivated to do that. If this is the case and you still have a problem, below are two possible things that may be needed. (#1) Need to improve practicing procedures. Pick one of the students who is stuck and be that student’s partner while they practice orally. Make sure they are saying the whole problem and the answer aloud so you can hear what they are saying. Correct even any hesitations, not just errors. Correct the student by saying the correct problem and answer, having them repeat the correct problem and the answer three times, then back up three problems and move forward again. Solution: Monitor your students closely during oral practice to see if they are all following the correct practice procedures. If you have quite a few students who aren’t practicing well you may need to re-teach your class how to practice. [Note: Even if they know how to do it but aren’t doing it right, treat it as if they just don’t know how to to do it correctly.] Stop them and re-do the modeling of how to practice and how to correct for several days before allowing them to practice again. If your students haven’t been practicing the right way, they won’t be passing frequently, and they will be unmotivated. You have to get them practicing the right way so they can be successful and so they can be motivated by their success. Solution: If you have poor practicing with only a handful of students you might assign them to more responsible partners and explain to them that they need to practice correctly. During oral practice monitor them more carefully the next few days to be sure they are practicing better and passing more frequently. (#2) Need to review test problems also. The problems practiced around the outside are the recently introduced facts. The problems inside the test box are an even mix of all the problems taught so far. If there has been a break for a week or more, or if the student has been stuck for a couple of weeks, the student may have forgotten some of the facts from earlier and may need a review of the test problems. Diagnosis. Have the student practice orally on the test problems inside the box with you. If the student hesitates on several of the problems that aren’t on the outside practice, then the student needs to review the test items. Solution. If you have this problem with quite a few students (for example after Christmas break) then have the whole class do this solution. 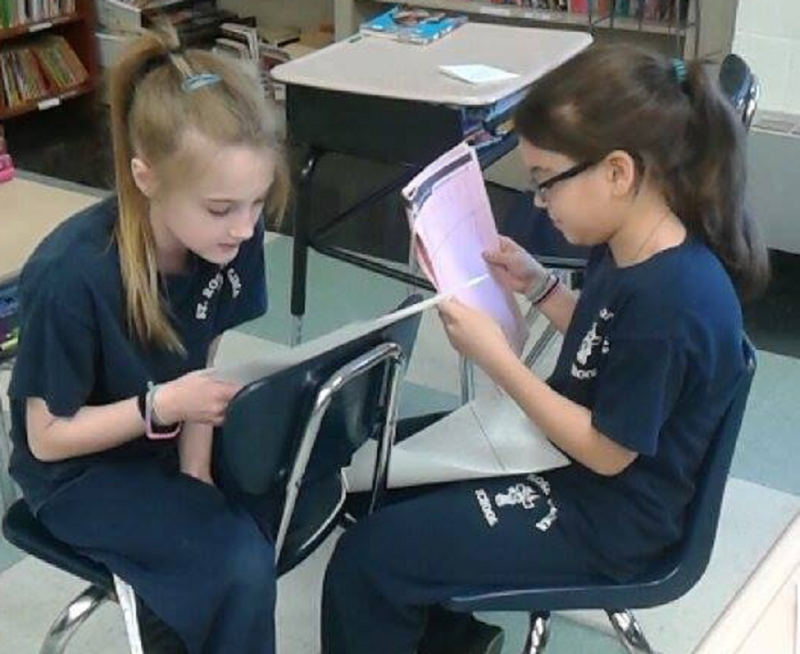 For the next three or four days, after practicing around the outside, instead of taking the 1 minute test in writing, have students practice the test problems orally with each other. 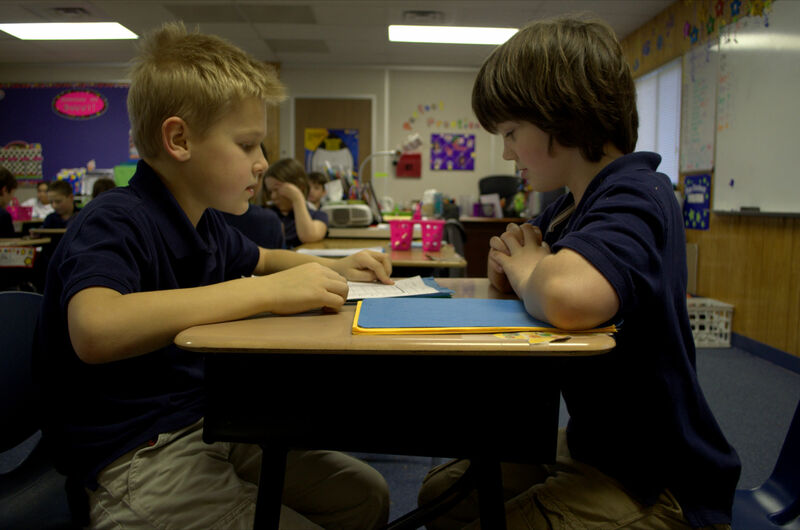 Use the same procedures as during the practice—two minutes with answer keys for the test, saying the problem and the answer aloud, correction procedures for hesitations, correct by saying the problem and answer three times, then going back—then switch roles. Do this for three or four days and then give the one-minute test. Just about everyone should pass at that point. Solution. If you have this problem with a handful of students, find a time during the day for them to practice the test problems orally in pairs. If the practice occurs before doing Rocket Math so much the better, but it will work if done after as well. They should keep doing this until they pass a couple of levels within six days. If neither the first or the second solutions seem to work, write to me again and I’ll give you some more ideas.